In ancient Egypt, the half circle is the hieroglyphic letter t which symbolizes the earth, and it may be of further significance in this context that the letter t was used as a suffix to denote the feminine in hieroglyphic writing.... Writing. The ancient Egyptians believed that it was important to record and communicate information about religion and government. Thus, they invented written scripts that could be used to record this information. 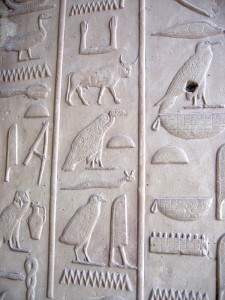 The most famous of all ancient Egyptian scripts is hieroglyphic. Hieroglyphs written in red paint on the floor of a hidden chamber in Egypt's Great Pyramid are numerical signs meaning 100, 20 and 1. 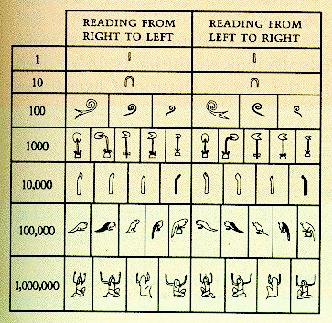 The “sacred writing” was hieroglyphics and “document writing” referred to demotic—this confirmed that the inscription was the same message three times over, providing a way to begin translating hieroglyphics at last!